Before your work relied so heavily on electronic data, you probably worked with paper records, and in some ways, that was easier to keep organized. If you didn't throw out or consolidate your paper records, they took up valuable office space. When data lives in our email or in the cloud, it's easy to store it and forget all about it. This can cause headaches for yourself and especially for your co-workers when collaborating in a department workspace, and as described above, can present compliance issues. Follow some of these tips to get and stay organized! 1. When creating folders, try to imagine your successor making sense of the structure. Box allows you to create one-off folders and share them at your discretion, but that also gives you freedom to make a mess. Let's say you have a project - "My Project," and you only plan to collaborate with the same 2 people on that project. 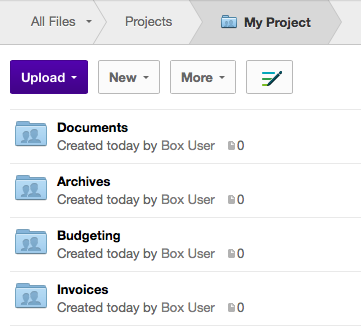 The naming isn't bad, but these folders could easily be nested inside of 1 project folder. The only good reason to do the above is if each of those folders requires a different set of permissions. 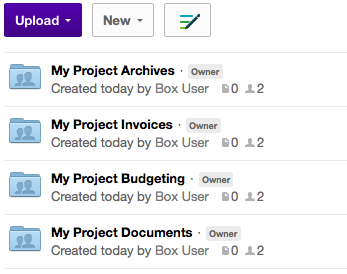 Instead, try creating Projects > My Project > Archives/Budgeting/Documents/Invoices. You'll have less clutter in your Box account, all documents regarding that project will be contained to one parent folder, and you'll only have to set permissions once. 2. Make a private folder for yourself, shared with no one. This a great first step for having a private space of your own. 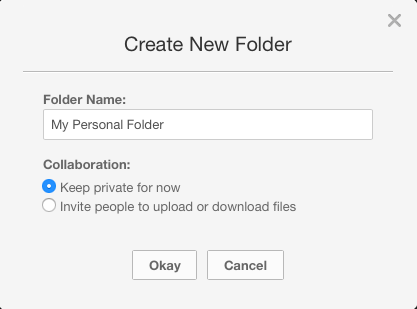 To do this, simply create a new folder and opt to keep it private. 3. Make use of retention schedules. If you know you want to delete a file or group of files by a certain time, ask IT to set up a policy (it.emerson.edu/help to place a ticket). See Retention Schedules above for more information. 4. IT maintains folders for Staff and Faculty Departments, Courses, Student Organizations, Interdepartmental Projects, and Interdepartmental Collaboration. These are owned by IT, so they do not have quotas applied to them, and will survive turnover better. If you have a new Student Organization, Campus-wide project or committee, Department, or Course you'd like to use Box for, simply contact IT at it.emerson.edu/help so we can build those for you. 5. Organize your folders in such a way that mitigates or disallows undesired sharing. For instance, if you create a folder for a Project and you don't expect you will ever have to share its contents externally, make sure you've set the folder to only share within Emerson. Carefully review Share Files and Folders for details. 6. 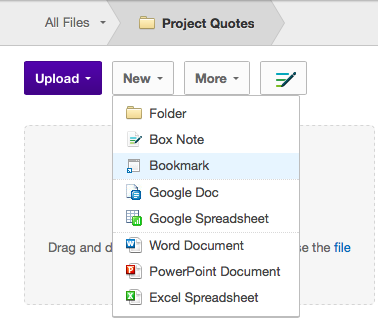 Use Bookmarks to categorize folders in more than one place. For instance, suppose you want to place a file in a "1 Year Retention" folder, but you also want to place it in a folder that makes more sense to you organizationally (for instance, a folder called "Project Quotes"). 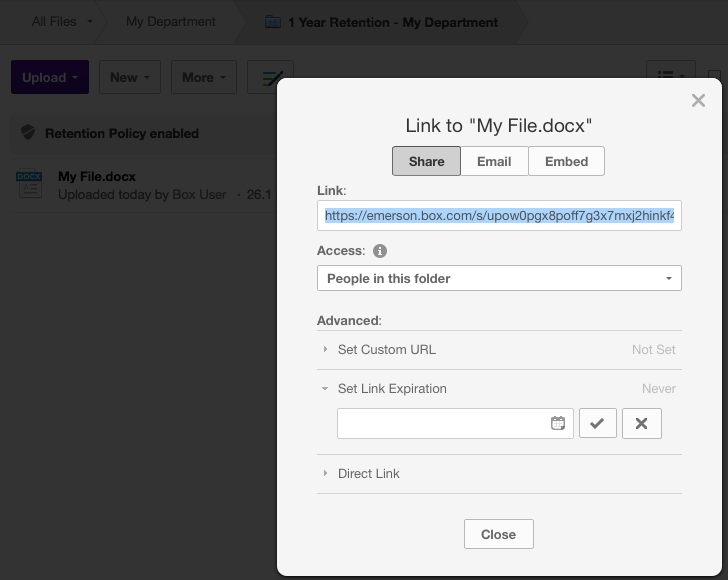 Go to the original file and click Share, and copy the Share Link. Don't forget to remove any link expiration. Open the desired folder and click New > Bookmark. 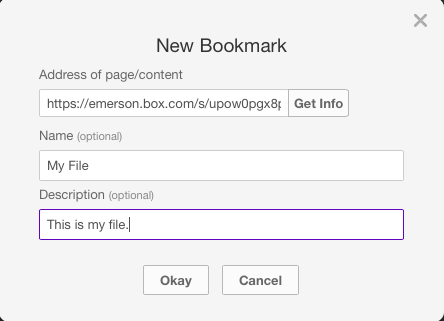 Paste the Share Link into the "Address of page/content" field, and name the Bookmark. Now a shortcut of your file lives in a folder that makes more sense categorically, and the original file continues to be classified as a file to be retained for a year. Think of other ways this might apply and use it to keep organized. 7. Name your files sensibly. Again, ask yourself, if someone else was looking at my files, would they know what they are? 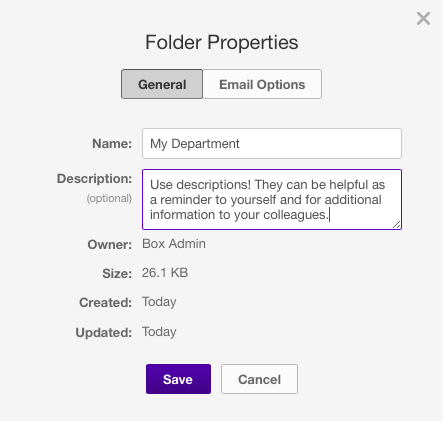 If it's helpful, use the description field in files and folders - right click the file or folder, and go to Properties > General Info.